In the complex ecosystem of Casa de Suebob, we have developed a problem. I have a theory of how it came about. Somewhere between the tasty treats left in the compost pile and the month where I neglected to mow the grass (ok, six weeks, whatever) and the fact that Goldie has begun hunting relentlessly out in the yard, the mice decided to take refuge IN the house. 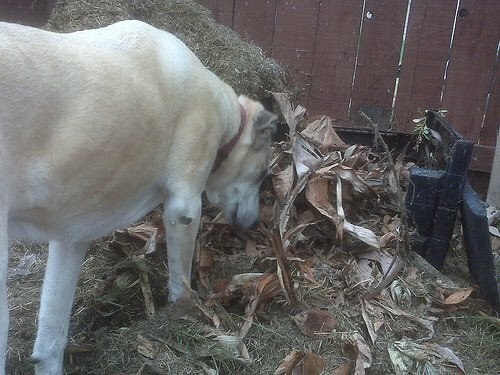 Goldie hunting in the compost, where something lives. Or under the house with frequent forays into the house. The house has become the playground of the mice. And the dog, who hunts so assiduously outside, does not seem to bring her hunting game inside. While the mice dance the macarena in the cabinets, she slumbers peacefully on the couch, snoring and dreaming of the mice in the lavender bush outside. Meanwhile, I am awake, thinking I should do confront them, knowing they will only run away and mock me by returning 20 minutes later. Thus, I bought mousetraps. People who are aware that I have been a vegetarian since the time of Prince's first album (no connection) are sometimes surprised that I would kill little living beasts. Au contraire, mon frere. When living beasts are on my turf - especially VERMIN - they play by my rules. My rule about mice is: The only good mouse is a dead mouse. Same with spiders. Dead. The mousetraps have been a significant success. I don't want to say how many mice we have caught, but it is more than one and fewer than a mini-vanfull. Still, a frightening amount. Last night I came home to find a mouse in the trap. These are new-fangled plastic clippy traps, so you simply squeeze them open to dispose of the mouse properly. I picked up the limp little mouse and opened the trap over the kitchen trash and let its body fall into the bag. Where it promptly recovered from its formerly limp state and sprang to life. I could hear it scurrying around among the potato peels and coffee filters. "Think, think, think," I thought, because this is the kind of thing I have to tell myself when I am too freaked out to just actually think. Meanwhile the mouse was hopping around in there. I had a stroke of brilliance. My dog loves to kill mice. I had a mouse! I could simply take the plastic bag out into the driveway, open it, and my dog would dispatch the horrid little thing. Except the dog would not cooperate. When we went outside, she ran all over the yard EXCEPT near me. 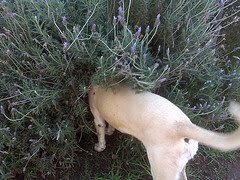 She went and looked in the lavender bush for mice and would not come out. She spends about 3 hours a day this way. Her deafness makes getting her attention all the more difficult. I finally gave up and double tied the bag and slammed it on the ground a few times, hoping to do some damage. Yes, there's a reason my neighbors think I am insane. I mean, what would you think if your neighbor were out in the driveway at 9 pm in yoga pants, slamming the kitchen trash bag onto the ground repeatedly? I rest my case. I put the bag out in the big green lidded trash bin. Cut to today. Is this story over yet? Why, no, it isn't. I came home from church and went to toss stuff from my car into the bin. Where I heard scurrying. Scurrying, people. The mouse was alive and well. Can you hear me heaving a sigh? So. In another act that will seal the neighbor's opinions forever, I took the trash bags out of the trash bin in the driveway and looked at the mouse jumping around in there. I called the dog and tipped the bin over for her to see the mouse, where she promptly lost her little doggy mind. She leapt into the bin. So the mouse leapt out. She didn't see the mouse run between her feet and under my car, through the garden bed and yes....back under the house. That pesky mouse got snapped in a trap that has killed several other mice, bagged, slammed, offered up as a dog toy, tied in a plastic bag, binned, offered as a dog toy again and STILL managed to make it back to the place I wanted it least. So the score is Mouse 1, Suebob 0. But this game is not over yet. I'm thinking of borrowing my neighbor Rusty's cat. I mean, the cat must be tough - it lives with Molly the pitbull - and it can't hurt to go over and ask to borrow his cat, can it? He already thinks I am insane.